Using improved magneto-optical technology, superior to that used on rewritable CDROMs, the Fujitsu MCJ3230SS storage device can hold up to 2.3Gb of logged Sonar 2031 data. This logged data may be viewed whilst the Sonar 2031 is still operational, allowing the operator to compare current and previous data. 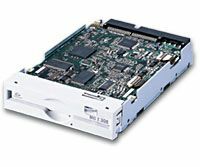 With a quoted data transfer rate of over 8MB per second, and seek time of 19ms, the SCSI variant of the MCJ3230 family was chosen by Curtis Technology for the Sonar 2031 system. The data is stored on industry standard removable 3.5" MO optical disks which are both easily available at a sensible price, and have a good cost/capacity ratio.